The links below are to youtube videos that I have found helpful in my quest to make ISK. Draze Swift Products has a good long 1hr 20mins video on station trading in his Eve online Videos in this play list. Three trading videos from Caleb Ayrania in this play list. 4 videos on Station Trading by toxicity959. Gives a good run through of what the skills mean. Also goes through his thinking on how to find items to trade. Pretty much all Eve online videos by andrewthered1 in this play list. The 8 minute CCP Planetary Interaction guide is a good place to start. Two 40 minute videos by Gorthour Decievers on Planetary Interactions. The first video deals with setting up an extraction Planet. The second video deals with setting up a factory planet. Excellent starting videos for Planetary Interaction. This is the 2013 Fanfest Video on Eve Economy given by Dr Eygo. Well worth listening to. I talked about it in this post. This is the 2014 Fanfest video on the Eve Economy given by Dr Eygo. i talked about the 2014 Fanfest economy interview in this post. This is an interview with Dr Eygo at 2015 Fanfest (he had left CCP at this point). The interview was by Etienne Erquilenne on the blog of Lockefox on his blog at Eve-Prosper. i talked about this interview in this post. This is a presentation by a member of Red Frog on their Hauling businesses at the 2015 Fanfest. i talked about it on in this post on courier contracts. This is a presentation by an Eve trillionaire at the 2015 Fanfest. I talked about it in this post - confessions of an Eve Trillionaire. 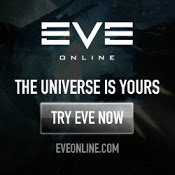 At Eve Vegas 2015 CCP Quant made a presentation on the Eve Economy. I discussed it in this post - Eve Economic Update September 2015. A collection of youtube casts from Pandemic Horde. Firstly, a series of 10 videos going through the basics of Eve. Starts as if a new player had just logged on and goes through it all. Also includes some quick guides for flying in null sec and Asteroid Belt Ratting in null sec. Secondly, there is a series of Pandemic Horde Lectures which includes a talk on Industry by Steve Ronuken as well as a lecture on surviving in Low Sec. All good stuff and ideal for those just starting or those thinking about heading into Low / Null Sec.